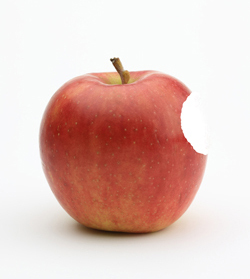 Does blood bleed when you bite an apple ? You would remember T.V. advertisement of toothpaste. It was televised for the first time approximately 50 years ago (1964). 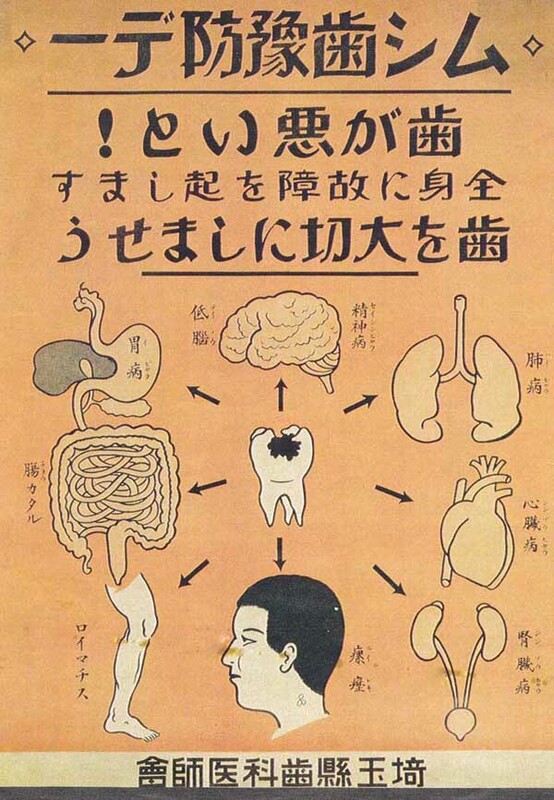 It is said that this advertisement gave an opportunity to let many people know that the disease of the tooth is not only cavity. By the way, we think whether the one looking at a homepage already has enough judgment about periodontal disease now. 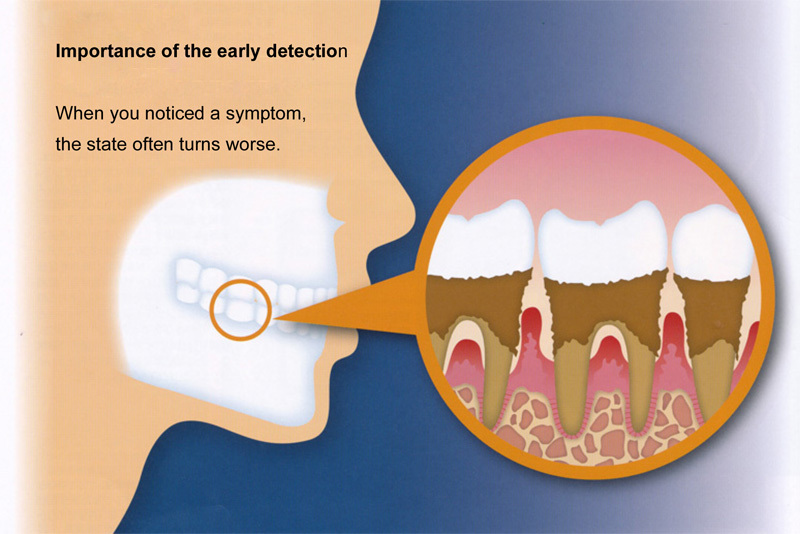 Briefly periodontal disease is an infectious disease and is a chronic disease and is a life origin-related disease. 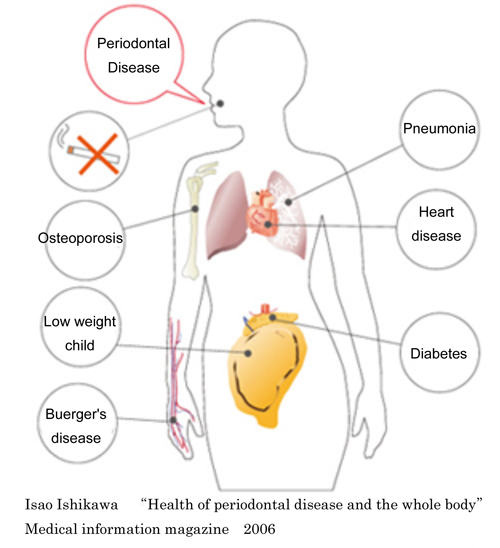 This page introduces the basic knowledge of periodontal disease. 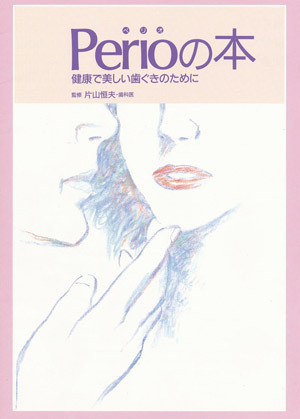 We would like to introduce the booklet of periodontal disease with full illustrations. 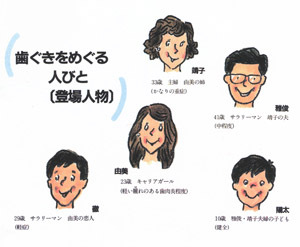 We are surprised why Mr. Katayama made such a booklet. It uses illustrations abundantly and feature a story of a certain family. Biofilm (also called plaque, dental plaque) is formed when sucrose is broken down by an enzyme called glucosyltransferase (GTF) which Streptococcus mutans secretes and make insoluble glucan. Figure bellow The bacteria exchange information using QS signal becomes the biofilm group and builds the territory in each part and lives. Plural bacteria make biofilm which are slimy while taking the communication using QS signal after floating bacteria attaching, and having formed a microcolony. When biofilm is formed, various other bacteria are attached, colonized and repeat an increase and the collapse. And it produces acid during 24-48 hours and begin to dissolve tooth. This leads to actual outbreak of cavity. In addition, the accumulated biofilm acts as the barrier protecting bacteria against oxygen, antibiotics, the self-purification of saliva. 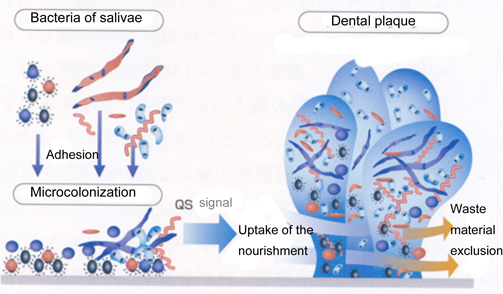 Therefore the tooth under coated biofilm becomes the environment with little air, and it creates an environment where anaerobes spread a lot..
Periodontal disease is a disease to have anaerobes to get into along the tooth root from the periodontal pocket which is the border of a tooth and the gum. When bacterial breeding becomes enormous, bacteria invade the pocket deeply, and the bone melts steadily accordingly. As subjective symptoms hardly come out at the early inflammatory stage, it progresses while the person cannot not notice it. We call such a disease Silent Disease. Sometimes bleeding be observed in the mouth well when you brush your teeth, and you might find red parts in the gums. It is important not to overlook such a slight change ; is pointed. It might bleed when it progresses a little more when you brush your teeth. Then a person feel that a tooth loosened and the person feeling gums itchy. Furthermore, mobility of teeth gets larger when it progresses and repeats swelling, and the drainage of the gums occur. It becomes difficult to chew it in this stage. A risk to lose a tooth by leaving unattended rises steadily. 1. Kolenblander PE. Oral microbial communities:biofilms,interactions,and genitic systems. Annu Rev Microbiol, 54:413, 2000. 2. Katsuji Okuda, Dental biofilm, Ishiyaku shuppan,2010. 3. Katsuji Okuda,　Battle with the assassination group den Tal biofilm conferring on the bidding, Japan Dental Association magazine, 64:19, 2011. Periodontal disease has deep relation with various diseases of whole body, and in late years it began to attract more attention. The dental focal infection, implies an infectious disease of tooth and periodontium and said that a person has a disease secondarily to different organs. Besides tooth and periodontium, tonsil and rhinopharynx are considered as the source of infection, too. ・OsteoporosisIt is lack of estrogen that it is thought that it is the most important as the cause that periodontal disease is easy to move in a patient of the postmenopausal osteoporosis. When secretion of estrogen decreases, the bone of the whole body becomes fragile, and the alveolar bone supporting a tooth becomes fragile. In addition, in the periodontal pocket, a material causing inflammation is made, and it is thought that progression of periodontitis is accelerated. In many studies, it is reported that I am associated with osteoporosis and the loss of teeth. Therefore, the postmenopausal woman is easy to suffer from periodontal disease by a decrease in estrogen without periodontitis, and it may be said that it is in condition to be easy to open. ・Arteriosclerosis, heart problem, cerebral infarctionAs for the arteriosclerosis, lifestyles such as the inappropriate eating habits and lack of exercise, stress were considered to be a factor, but the bacterial infection such as periodontal disease pathogens has been performed a close-up of as a different factor. A material inducing arteriosclerosis by the stimulation such as periodontal disease pathogens appears, and there is plaque in blood vessel, and the way of the blood narrows. When plaque comes off, and a lump of the blood is made, blood vessel is clogged up on the spot and is clogged up in the narrow place of the blood vessel. The blood vessel which sends blood to the myocardium by arteriosclerosis becomes narrow and is the disease that is occupied, and blood supply disappears to myocardium, and may result in death. The plaque of the blood vessel of the brain is clogged up and is a disease that a lump and plaque of the blood fly from a carotid and heart and are clogged up with a cerebral blood vessel. It is said that the person with periodontal disease is easy to suffer from the 2.8 times cerebral infarction of the person who is not so. ・Kidney diseaseOne of the causes to develop in glomerulonephritis includes a virus and bacterial infection. Most of staphylococcus aureus and streptococci causing the glomerulonephritis exist a lot in the oral cavity including periodontal disease Hara-related bacteria. The bacteria in the mouth get in blood and may develop in glomerulonephritis because a created inflammatory material gets into the blood by periodontitis. ・Aspiration-related pneumoniaAspiration-related pneumonia is pneumonia to develop by swallowing food and an alien substance to the trachea and the lungs by mistake. I swallow the bacteria in the mouth with food to have a decline in these functions if it becomes old, and bacteria may be in the lungs from the trachea when choked on this occasion. It is said that bacterial most causing aspiration-related pneumonia are periodontal disease bacteria, and control of periodontal disease becomes important to the prevention of br aspiration-related pneumonia. ・Buerger's diseaseBecause it was reported only after I stop at Leo Buerger, for the disease that names it, and was named Buerger's disease (English reading) of the reporter, I may be called thromboangiitis obliterans. As a result, by a disease to result in obstruction to the erasion blood vessel of limbs, an ischemic symptom of limbs, fingers and toes is a disease to be caused. The person who had a diagnosis of periodontal disease recommends treatment from all over the pregnancy. ・DiabetesUntil approximately ten years, the calorie intake of the nation was parallel to the onset of diabetes after the war and was correlative. However, the diabetics continue increasing afterwards though a tendency to decrease has calorie intake. I do not hit it in many problems, but it means that unit sales and the correlation of the car are seen. The decrease in momentum may be to say a big factor. However, this is the statistical reasoning to the last. It is thought that lap disease and diabetes are detrimental mutually. It is revealed that diabetes is improved by periodontal disease treatment. ・RheumatismBy some relations of rheumatoid arthritis and periodontal disease become clear recently. The characteristic of the rheumatoid arthritis is bone, joint destruction "by" durability synovium flame. Inflammatory cytokine is a material necessary for living body defense, but originally lets, on the contrary, you enlarge it and reproduce inflammation when it is overproduced continuously. When the antirheumatic drug cannot show an effect when periodontal disease is not treated and does not improve rheumatoid arthritis, it means that periodontal disease is hard to improve. In this way, it is revealed that inflammation of a tooth and the periodontium has many influences on a whole body in the recent studies. In association with the diseases of the whole body, must be investigated further. You should review the lifestyle including everyday toothbrushing and eating habits which are connected in preventing various diseases of the whole body. Good oral management leads to the prevention of disease of entire body. The cause of the death of 26th United States President Theodole Roosevelt died in 1919 was "pulmonary embolism ", and it is said that its cause was a cavity of the tooth. As he was busy, he did not treat the cavity, and the pus of the root apex flowed in to the blood vessel causing pulmonary embolism. Let's check periodontal disease bacteria chain in oral cavity !